Wow what are Mercian eating, the 2016 to 2017 range of Mercian hockey sticks has gone all ‘Quinoa & Rocket salad’ trendy on us, so much so, you can wash it down with a glass of Prosecco! We have always loved the undoubtable love of hockey Mercian have shown in the bespoke, detailed creation of their hockey sticks and with the latest logo and super-hot designs they are really up there with the best brands in the world. Even the lower parts of the Mercian 2016 to 2017 season range of sticks have high carbon contents, the thing I’ve always loved about Mercian though is their use of innovative materials. Basalt features in the material composition of a number of Mercian hockey sticks in this range on sale. Basalt is a rock like material and as such allows the sticks to pack one hell of a punch. Also in the Evolution 0.1 and the Evo 0.5 Mercian feature ‘Piezo-electric fibres’ which are designed to reduce vibration in the shaft of the stick. Many think this stops your hands hurting, which it does, the other effect when you buy this feature is that it allows more power transfer in to the ball. These special materials in Mercian hockey sticks are just an example of the high quality that Mercian put in to the design and creation of their hockey sticks for you to buy. Mercian are really pushing the limits with this range, the Ultimate bow is right on the edge of FIH limited with the bend at the lowest legal position you can buy of 200mm up from the heel of the head and is a full 25mm curve. This rivals the most extreme low bow shapes on the market. Other sticks feature the Pro Bend which is a more traditional low bow shape at 250mm up and a slightly less extreme bend of 23.5mm. Absolutely perfect for the player looking to buy a mix of control and the ability to carry out awesome 3D skills. With an option for players looking for a higher mid-bow shape and a less extreme low bow hockey stick, the 2016 to 2017 Mercian range really has an option for all. Why buy a Mercian hockey stick? 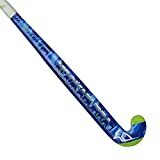 If the above isn’t enough to send you online now to buy a Mercian hockey stick then I highlight the quality in this range that is on sale for the price. Ok the top of the range sticks are fairly expensive, you can get 70+ % carbon sticks, with Kevlar & Basalt for a great price. Also consider the detail they put in to weighting the sticks properly, the tri-core internal chambers for general power enhancements and rigidity and the little silicon resin bobbles on the face of the sticks to help ball control and you get yourself a real top of the range stick at great prices in the middle of this range.